Batteries for Jaguar's next-generation "Electric Drive Units" will be assembled in the U.K. In results for the quarter ending Sept. 30, 2018, the company announced a pretax loss of £90 million ($116 million) on revenue of £5.6 billion ($7.2 billion), down 11 percent on the same period in 2017. China sales plummeted by almost 44 percent year-over-year. 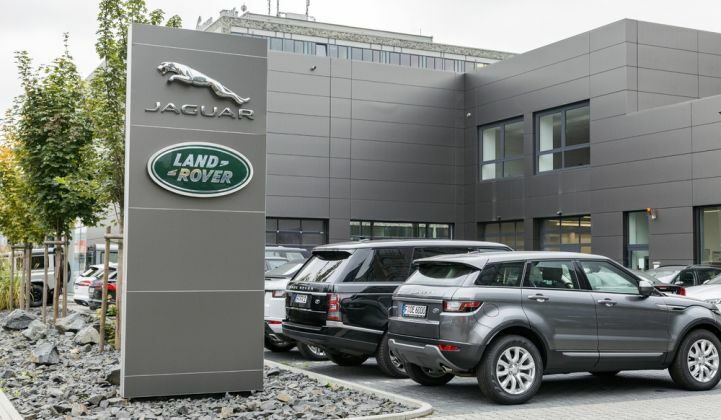 The figures prompted Jaguar Land Rover to introduce a turnaround strategy designed to improve cash flows and profitability, and fix issues related to sales performance, variable costs, product delays and quality. The carmaker also said it would be cutting capital investment by £500 million ($644 million) per year in its 2019 and 2020 financial years, from £4.5 billion ($5.8 billion) to £4 billion ($5.2 billion) annually. The cut comes just as Jaguar Land Rover is planning to invest more in vehicle electrification. At present, the company only has one electric vehicle, the Jaguar I-Pace, in its portfolio. The recently launched model accounted for less than 1 percent of sales in the second quarter of Jaguar Land Rover’s 2019 financial year, but the company remains committed to e-mobility. In a quarterly report released last July, Jaguar Land Rover said it had around five and a half months of order cover for the I-Pace and was expecting to ship 20,000 units over 2020 and 2021. The company also said it expected electric vehicles to account for 20 percent of sales in the medium term, and that it would be introducing mild hybrid, plug-in hybrid or battery-powered variants of all its models starting in 2020. Jaguar Land Rover is not the only major carmaker attempting the switch to electric vehicles against a challenging economic backdrop. Last November, General Motors announced it was undergoing a major corporate restructuring, including plant closures and job cuts, in response to declining consumer demand for gasoline-powered sedans. One of the victims of the move was the iconic Chevy Volt plug-in hybrid, which General Motors decided to discontinue after finding that owners weren’t using the Volt’s gasoline engines nearly as much. Elsewhere, carmakers such as Renault-Nissan-Mitsubishi and Kia Motors are also placing heavy bets on battery-based vehicles, while electric vehicle poster child Tesla managed to come through a harrowing 2018 with record profits in the third quarter. Against this backdrop, it is reasonable to question whether a financially challenged Jaguar Land Rover will be able to move fast enough to carve a niche for itself in the increasingly hotly contested electric vehicle market. Last September, the Korea Times reported that Jaguar Land Rover had inked a cell supply deal with Samsung SDI. “Samsung SDI is expected to initially supply EV cells of 5 gigawatt-hours a year, which will be about 300 million cylindrical cells,” said the report. But it may take more than a supply deal and a new factory to crack the electric vehicle market, according to Rory McCarthy, senior storage analyst for Wood Mackenzie Power & Renewables. To staff a battery manufacturing center, “they would need to have a whole new breed of hires,” he said. As the Brexit debate rages, finding the right people might not be easy — particularly for a company that has just let go of 4,500 employees.